Here is something I never seen myself ever doing, raising money for my mum who I never seen getting cancer. I thought dementia like my gran suffered for over 10 years before passing away on November 21st 2014 would be the thing to get my mum later in life, but I really didn't see cancer ever coming my mums way, not after she has always given and put others ahead of herself her whole life. My mum for those of you who don't know her has two brothers (my uncles) with severe learning disabilities who she took on when my gran took ill, because of my uncles she took a career path in care and working with people with who have severe learning and physical disabilities because she knows how hard it is for families with them. She has been a foster carer for over 11 years providing weekend stays for kids in wheel chairs with learning disabilities, a very demanding role which did involve hoisting and a lot of back taxing moving. My Mum has Myeloma a rare type of bone marrow cancer and she has cancer on her spine which she is currently undergoing radio therapy for, her world has been turned upside down and it didn't need to have been. You see a few weeks ago my mum had severe back pain, so bad she couldn't get out of bed for 3 or 4 days, she didn't eat and when she did find enough energy to get out of bed she booked an emergency doctors appointment. The doctor she seen told her she had a trapped nerve and they gave her pain killers to manage the pain, my mum continued to suffer though and was struggling to walk. Again she went back to the local GPs, told them the pain killers were making her sick and told them she was still in pain and struggling to walk, so they changed her pain killers and again just told her it was a trapped nerve an muscular. My mum being in so much pain, she ended up going to see an osteopath who manipulate your body, after all the local GPs kept telling her it was a trapped nerve, so of course you will go to someone who deals with trapped nerves. My mum was in pain still even after that, she was in so much pain she had the doctor come out for a house call to check her over, again he did his tests and told her it was muscular and a trapped nerve. Mum was in so much pain she had to start using a wheel chair, she was crawling up the stairs to get up them instead of walking and she kept falling, her legs just went on her multiple times, she was holding onto walls for support and there was clearly something not right. Now the doctor who made the house call made another house call a week later, I knew in advance he would be visiting then so I made sure I was there because I needed to make sure mum was going to get a referral for her back. 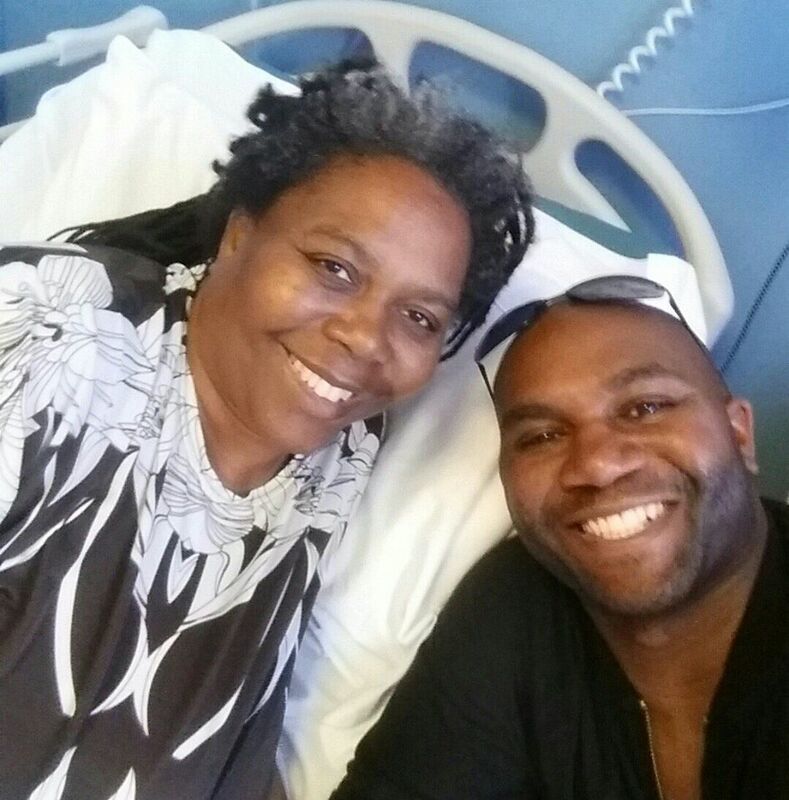 The doctor was visiting to talk to mum about some abnormality in her blood they had taken previously. So the doctor came and spoke to mum, told her about some abnormality in her blood, which my mum is used to being anemic so she didn't know anything wasn't right, the doctor said to her he was going to refer her in 2-3 weeks for a hospital visit to get it all checked out and he was going to leave it there. I spoke to him before he left and asked him if he's giving her a referral for her back and he said no because he had done some tests and there was nothing that fits for why he would be referring her to get a back scan. He told me he was referring her for blood tests in a couple of weeks and they would see from those if that explained why she was having issues with her back. So I said, so she could wait weeks for blood tests at the hospital and then they could say it doesn't explain her back and then she would need to wait for another referral for her back which would be weeks more. IT WASN'T UNTIL I SAID ISN'T THAT WHAT CANCER CELLS DO? So the doctor asked my mum if she had told me about her blood results and whether he could talk about them with me, she said he could. He then started talking about low white blood cell count, some protein that seems to be replicating because its chains were longer than they should be etc. I immediately came out with WELL ISN'T THAT WHAT CANCER CELLS DO! Until that point he hadn't even said the word cancer to my mum but it seemed like he was trying to avoid saying the word, my mum had no idea how serious that was until I said that. In the end I asked the doctor how bad things have to get before she gets a scan when mum had fell 3 times that morning just trying to go to the bathroom, fell multiple times the day before, was crawling up the stairs and was in a wheel chair to get around. He simply told me I could take mum to A&E if I felt she needed a scan for her back but he couldn't refer her for one or they would ask why he referred her and her symptoms didn't fit whatever he was testing her fore. Well the doctor ended up leaving anyway without agreeing to a hospital referral to scan her back to see what was going on. Well mum got a phone call from the doctor who made the house visit an hour or two later, he said he had referred her to the acute pain ward and she could go in the same day, I took mum in and arrived at 4pm, she wasn't seen by a doctor until 11pm and then they wanted to keep her in the night for scans. My mum didn't get her MRI scan until after 11am the next day, they took blood and a pee sample, they told my my mum she has myloema (a form of bone marrow cancer) and she also has cancer on her spine which is compressing her spinal cord which is why she lost the ability to walk. The wanted to start her on radio therapy right away for that and gave her steroids which is what they do for spinal cord compressions. They told her if they had seen her 3 weeks earlier (when she told her GPs about her issues) they would of been able to prevent it getting to the point where she ended up in a wheel chair and couldn't walk. They told mum they don't know if she will ever walk again because she has damaged her spinal cord by having still been moving around and not resting which she should of done if they had caught it from the start. My mum has had to stop her care work, fostering and her community gardening group for people with disabilities, she now has no income from a job and has to wait 3 months for any disability allowance entitlement. So not only is she battling with her radio therapy cancer treatments daily and being left in limbo waiting for results of bone marrow tests to come back, she has the added worry about how she is going to get by now she is in a wheel chair and pay her bills and stuff. Now my mums a strong woman, always been independent, not the kind of person to ask for help even if she needs it, but there is really a time for us all to ask for help and that is why I have put this page up so anyone can help contribute what they can to my mums fund. I am still waiting to hear from doctors on the latest results of mums blood tests, a bone marrow test that should of taken 10 days to update us and I've been waiting nearly 3 weeks for that, until that comes back I won't know what stage things are at with that and whether they will need to start chemo therapy after the radio therapy. The more money I can raise for my mums fund the less worry and more choices she has open to her, I don't want her to be in a position where finances are something that prevent my mum getting the best treatment she can.